Week 15 – Watch out for hazardous materials!! Hazardous Items – Ready to go! This upcoming weekend the city we live in is having a hazardous waste removal drive. I see this as my chance to clear all the hazardous things I can find from the house. Entering the house, I make a beeline to the garage because I have to imagine there are so many hazardous things swimming around here. As I walk in, it becomes clear that everything I need to get to is on the other side of the garage. I start by clearing a walkway through the garbage so I won’t kill myself attempting to walk across all of the trash. Having a clean path will make it easier to take things out as well. I get rid of a bunch of newspapers and garbage that are in my way to start. Then I come across a bunch of my father’s “organized boxes.” These are normally filled with the most random things ever. Magazines, papers, pencils, screws, tools, whatever you can imagine. I have already found a few of these boxes so far and they are so annoying to organize because they are always a random hodgepodge. I’m pretty sure my dad got this out of the dumpster in the first place. I definitely tried to get rid of this about 10 years ago. Now it’s GONE for good! One box is filled with magazines so I put them in a bag to try to throw them out. Of course my mother stops me and tells me they might be worth money. I take the nice ones out and put the rest aside for now. I will figure out if I’m really going to try to sell them at a later point. Of course I get a call from my mother the following day stating that she went on ebay and saw some of the same types of magazines for sale for $12. I double checked this and noticed that most of the magazines she was referring to didn’t actually have any bids and were never sold. I went to the trunk to see what magazines I had left and realized that I ended up throwing out the bag of magazines by accident anyways. Oops! I don’t think anyone would want to buy these things since I had taken them from an area that was full of mice/squirrel feces. Yuck!! So, back to cleaning up! After I got through that mess, I finally made my way to the other side of the garage where there were plenty of hazardous things for us to take out. Yes, I am saying “us” because my mom actually helped me today. She helped carry a lot of the garbage and hazardous items through the house! 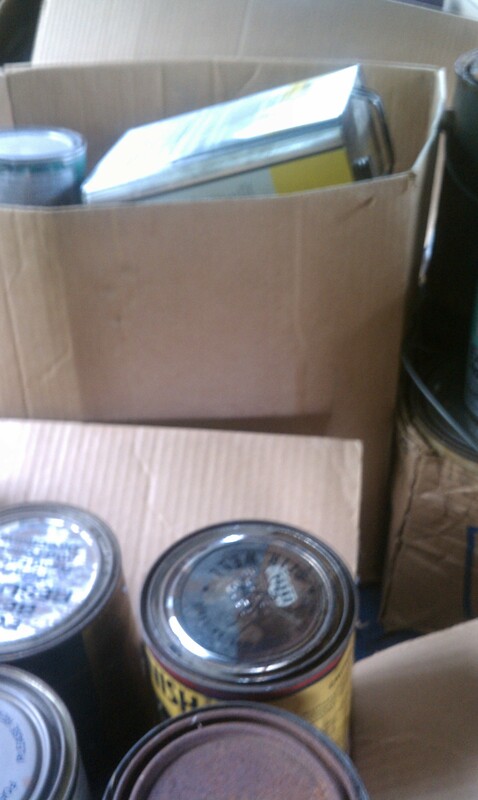 I was shocked to find that the 15 or so paint and 6 turpentine cans were actually empty!! My father used to paint doors on the side when he was involved in construction, so they were probably used for that. That was about 20 years ago though! I am happy to see they are empty because they will be much easier to dispose of! 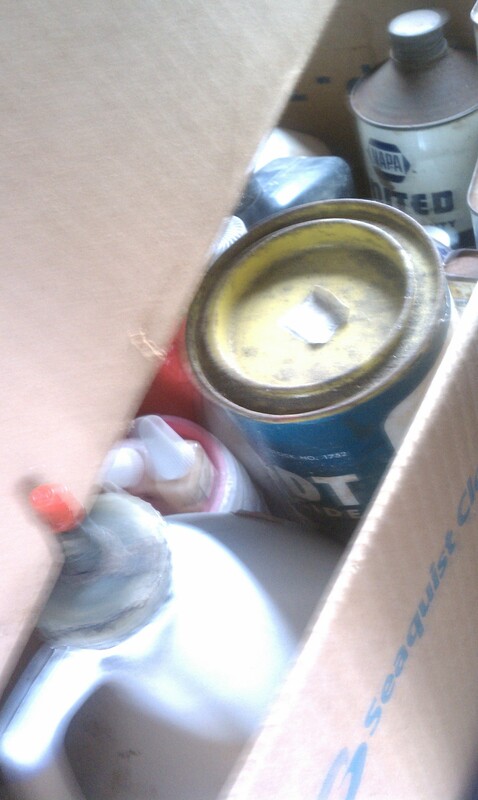 We ended up pulling about 4 boxes of wood stain, paint, turpentine, and other random hazardous items out. At one point my father was watching as I pulled out container after container of stuff and he commented “wow, that’s a lot of junk! It used to be good, but now it’s a lot of junk!” I looked at him annoyed and dumbfounded. I responded “Yes, this is all of your junk!! !” I shook my head and proceeded to go through more of his piles of crap. We finally filled up my car and I left as quickly as possible. I would have pictures, but I was a filthy mess and my mother was around the whole time so I couldn’t let her see me take any pictures! I did snap a few pictures as I was waiting in the car for my mom on Saturday though. Sorry for the poor quality! Paint? We’ve got tons of it!! Saturday (hazardous waste collection day) came around and I called my mother. I said “hey mom, I’m coming to help bring stuff to the hazardous waste collection thing.” She said she had already loaded up the car and was ready to go. I told her I wanted to check out the house across the street for more stuff, so she told me not to take too long. This is the same person who says she is coming over in 10 min and shows up 1 to 3 hrs later. I head to my grandmother’s and grab a few things. I also asked my mom if she got rid of the paint in the basement. She acts like she doesn’t know what I’m talking about. 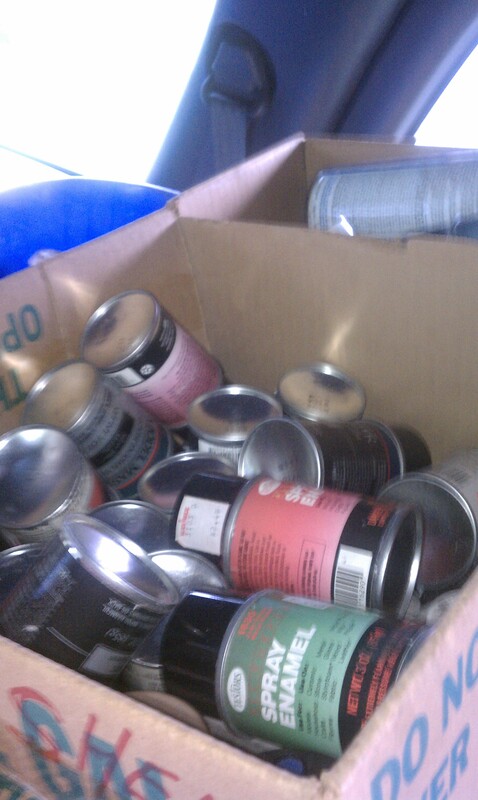 I go downstairs and find about 5 boxes of spray paint my father used for making die cast model cars. I started packing paint away to take to the hazardous waste drive and my mom comes down. She hurriedly states that some of the paint has never been used. Mind you they have a sheen of dust over them, so they aren’t very desirable in their current state. 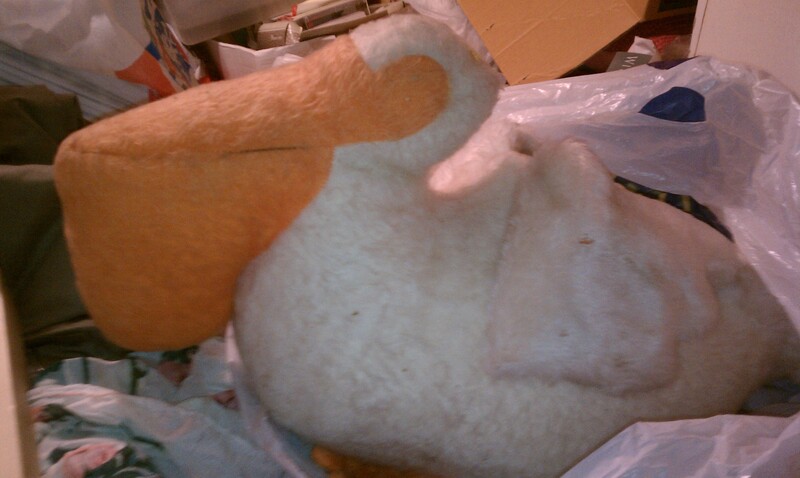 I ask her what she’s going to do with them and she says she is going to put them on freecycle. Great, she got that excuse from me last week as I said we could get rid of some things from my grandmother’s house on there. I throw as many cans in the box as possible (prob about 40 cans) and leave back another 40 or so as my mother is getting more and more annoyed. At least I can say I tried. This entry was posted in cleaning up, clutter, Garage, hoarding, Houses, mother, Uncategorized and tagged daughter, garage, mother, Piles by shecleansup. Bookmark the permalink.